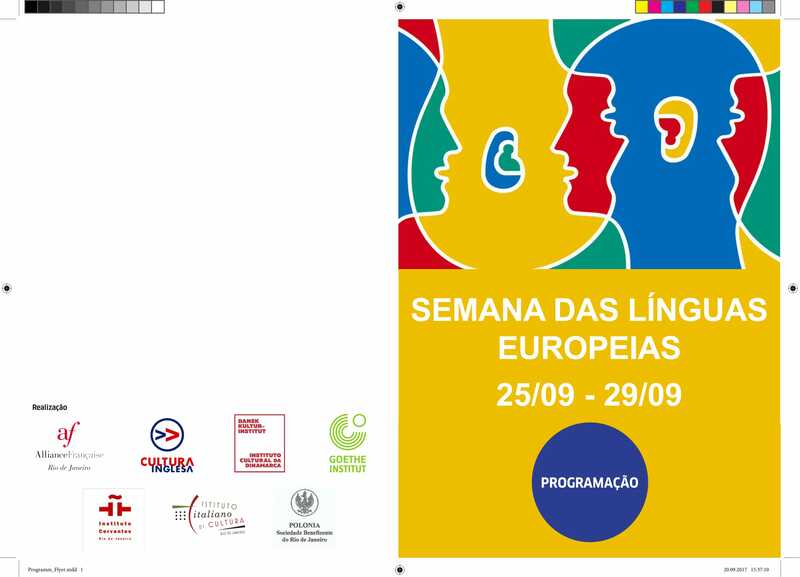 Events around the world annually celebrate the European Day of Languages (26 September), which was set up in 2001 at the initiative of the Council of Europe. Rio de Janeiro is not left out of the celebrations map. This year, the organizing institutes will carry out not only a day of activities, but a whole week, with playful proposals to stimulate contact with the languages of the continent. The French Alliance, the English Culture, the Goethe-Institut, the Cervantes Institute, the Cultural Institute of Denmark, the Italian Cultural Institute and the Polish Society Benefit invite everyone to a series of free activities from September 25th to 29th. From Monday to Friday, two daily classes of gastronomy will be given, offering the typical flavors of each country as a special ingredient. Free classes always take place from 10am to 12 a.m. and from 12:30 a.m. to 2:30 p.m., in the industrial kitchen of the Italian Institute of Culture. The vacancies are limited and, therefore, depend on pre-registration by email centro.iicrio@esteri.it. Already in the late afternoon / evening, the activities go through the world of music, games and literature. Each day, they are offered at one of the partner institutes. The French chef Frédéric Monnier, from Brasserie Rosario, will prepare a typical French dish with the students. 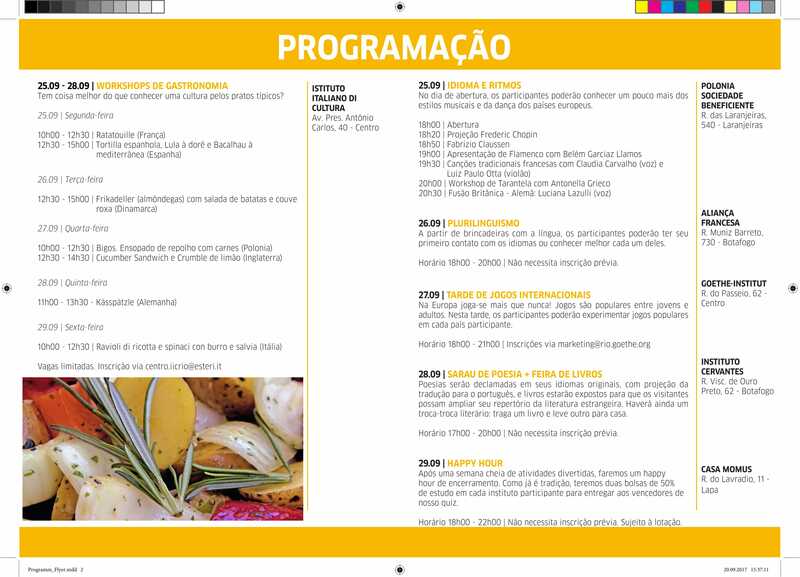 The chef of the restaurant El Pescador del Mediterráneo, from Barra da Tijuca, will prepare dishes with the students. Please, determine which gastronomy class you wish to enroll in. Participants will be able to learn more about the typical musical and dance styles of European countries. Poland will present a video projection of the performance of a classic piece by the most famous Polish composer, Frederic Chopin. Spain and Italy will present a lecture on their typical dances, respectively “flamenco” and “tarantella”, encouraging those present to dance by reproducing the steps taught! And France, Germany and England will present some songs typical of these countries. Location: Polônia Sociedade Beneficente. No prior registration is required. The dishes Frikadeller (a type of Danish meatballs), kartoffelsalat (potato salad) and varm rødkål (red cabbage), all by the recipes of famous chef, Claus Meyer. 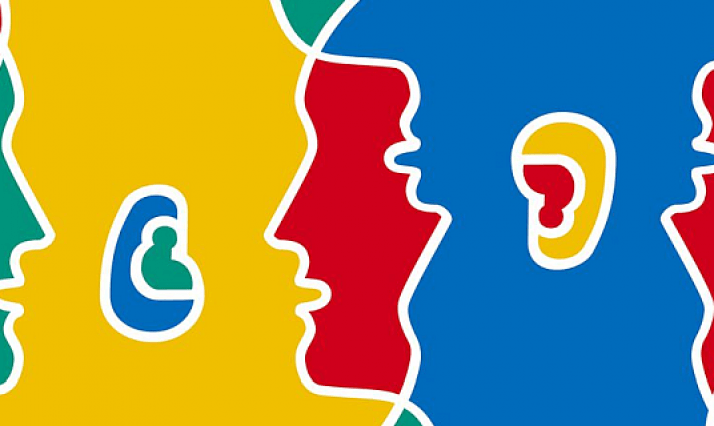 From playing with the language, participants can have their first contact with the languages or know each one better. The activities will happen simultaneously. Location: Aliança Francesa. No prior registration is required. Participants will have the opportunity to learn how to prepare Bigos, a typical dish consisting of a stew of cabbage with smoked meats, accompanied by boiled potatoes. Cucumber Sandwich and Lemon Crumble are not to be missed at English parties. Márcia Reis, owner of Madalenas Doceria Artesanal and professor of English Culture, will teach you how to make these typical recipes, interacting with the language and bringing cultural curiosities. In Europe you play more than ever! Board, dice and card games are popular with both young and old. The best games are awarded annually. On this afternoon of games, participants will be able to try out typical board games, cards and/or reasoning from each participating country. With snacks and lots of fun, the participants will have their first contact with the languages. Activities will happen simultaneously and invite young and old to participate! Get to know the Kässpätzle (Käsespätzle), typical of Southern Germany. Poetry of the various countries will be recited in their original language, projecting the translation into Portuguese, and books will be displayed so that visitors can expand their repertoire of foreign literature. There will also be a literary exchange-exchange: bring one book and take another home. 10h until 12h30 – Cooking class: Italian cuisine. Learn to prepare a ravioli di ricotta and spinaci with sage. After a week full of fun activities, we will have a closing happy hour. As is customary, we will have two 50% scholarship scholarships at each participating institute to deliver to our quiz winners. Location: Casa Momus – R. do Lavradio , 11 – Lapa.